Yesterday my wife delivered a bucket of tadpoles and frog-lets to the house door. Rescued from a fate no tadpole should face. I put them in the spare little pot pond which was emptied of its fish as I had put them in with the water chestnuts to keep the mosquitoes under control. Very happy tadpoles. Which had me wondering where last years frogs got to. We’d heard calls but they seemed further away and I hadn’t seen them anywhere in the garden for months. Even after shifting all the garden when I put the raised garden bed in and retaining wall. This morning I helped my brother over at his farm house garden which has become over-run with weeds. I pondered the plight of the frogs as it was about this time last year that we had got tadpoles from the cattle trough. When I got home I backed the trailer up and had some morning tea and a wander around the garden and much to my surprise, there was a frog in the pond. 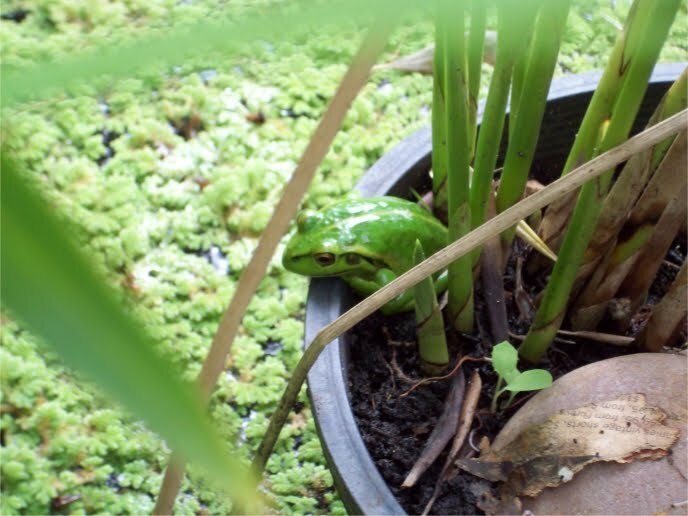 Much larger as a good winter of slugs and bugs would make your average garden frog, sitting on the edge of a pot. Wonderful. Alive. So, at least one of last years frogs is still around and we have some new ones on the way. ← Broad bean eaters – who? where?